Joining Cathy at Rambling in the Garden for her wonderfully heartwarming ‘In a Vase on Monday’. Pop over and visit her post and in the comments you can click on links to visit vases from gardens all over the world – and bathe in a flurry of flower petals. This is a paid for pattern: Illusion Mandala designed by Tatsiana of Lilla BjornCrochet. It made my brain ache the first time I made it and it took me a week to make – but it is a fantastic pattern with very clear instructions and a photo tutorial. Joining Cathy of Rambling in the Garden for her ‘In a Vase on Monday’ international Garden Party. I love this meme so much and enjoy seeing what gardeners from all over the world pop in a vase every Monday. My garden has slipped way down the list of priorities this year and I don’t have many flowers growing at the moment. Yesterday was the first day for ages that circumstances aligned for me to be able to spend the whole day tackling the jungle it has become. 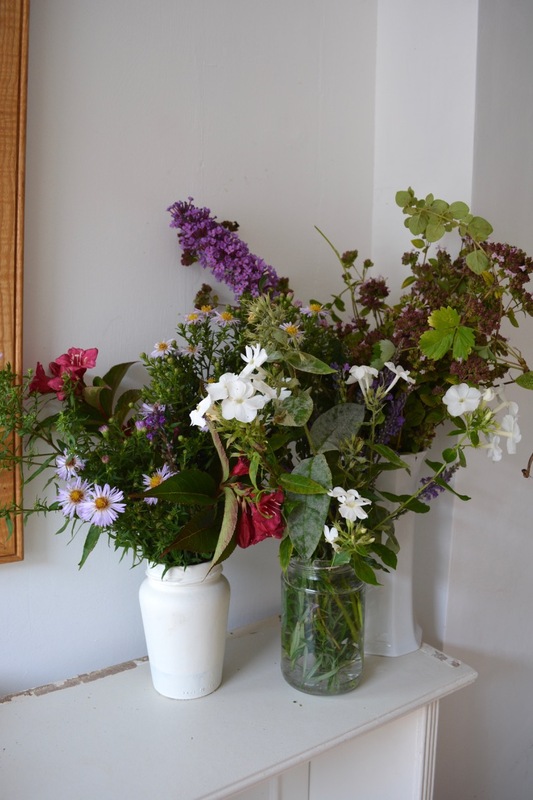 As I cut back, slashed and weeded, I saved the few flowers I found and plonked them in jam jars hoping to be able to make up a vase for today …. I looked at this sorry collection and realised something was needed for added value. Click on the photos if you would like to see them larger. 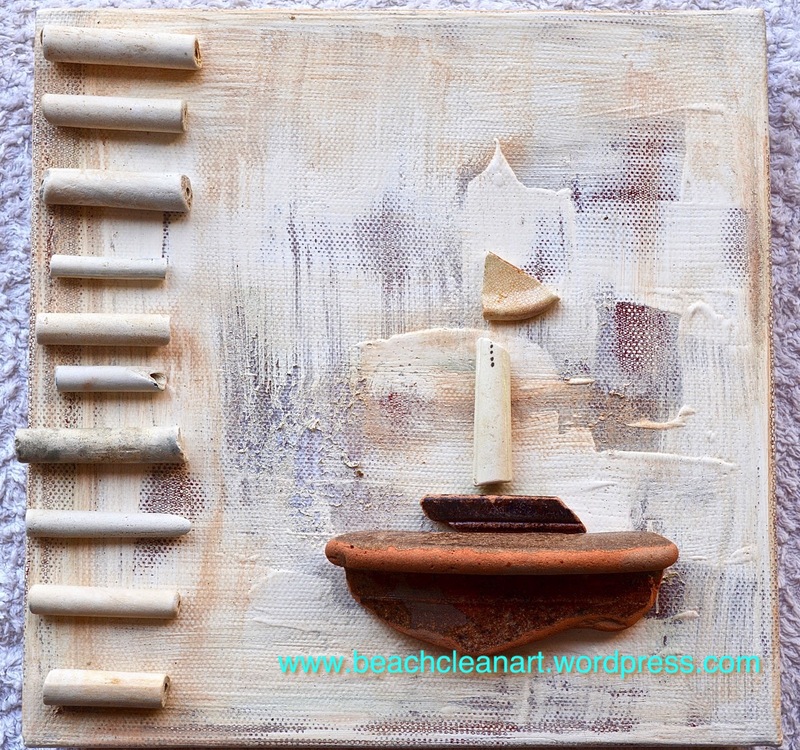 You can see the beginning of this mixed-media-mandala in yesterday’s post. 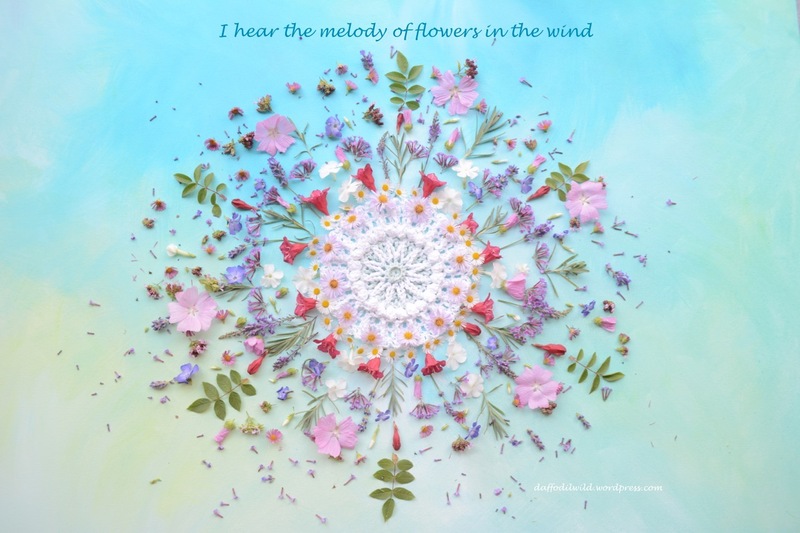 The words are a quote I have adapted from the book ‘Conversations With God’ Book 2 by Neale Donald Walsch, the quote is “a woman hears the melody of flowers in the wind”, but I wanted to change it so that everyone could relate to it. I spent ages playing around with bits and pieces before I arrived at this arrangement. I’d love to know what you think. The pieces down lefthand side are the broken stems of clay pipes, the rest is pottery found on that day. I am going to experiment with a new found toy – Sugru. (Introduced to me by Mrs Snail – she teaches us all so much!) I’m hoping to fix the pieces on to the canvas with this substance that turns to rubber, but no time left today as I’m off to pick up Big Bro and Little Bro from school in a minute. A Granny’s work is never done! 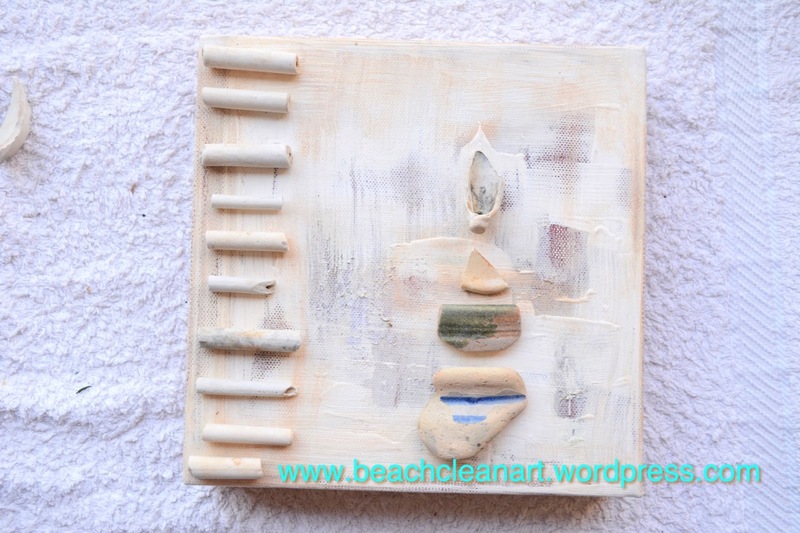 All pieces of art made on the Beach Clean theme are going towards and exhibition I will be doing with Miss E in Dorset Arts Weeks 2018. However we are beginning to talk about a smaller event next year – I’ll be sure to let you know all about it. 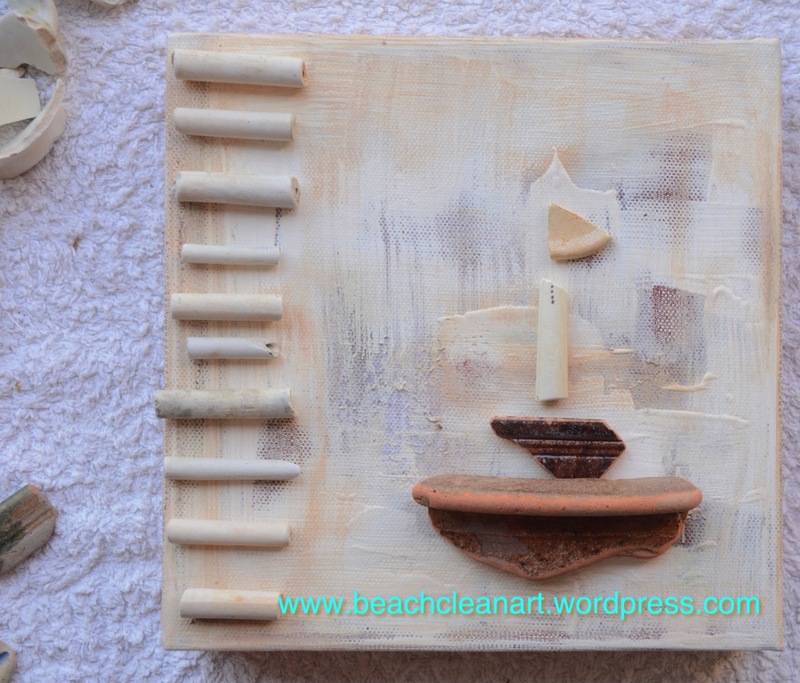 Remember this painting which i had just placed together but not yet fixed, when I wrote this Beach Clean Art post ? Today I set about fixing it all together. 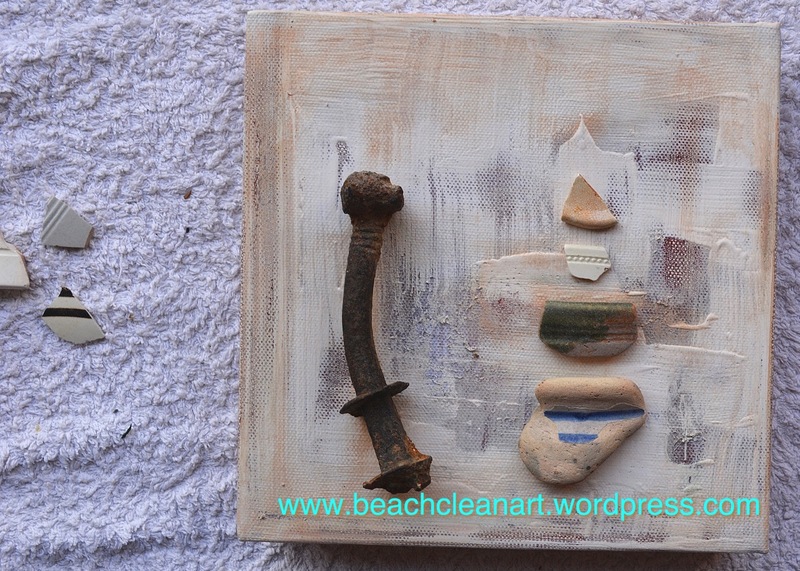 I really like the piece of wood on the right too much to let it go yet, so I replaced that element with some of the rust I found on Ringstead beach. Now I’m driving myself crazy trying to work out where to go next – does it look right as it is – less is more – or is this better …..
but is the balance right? does this look better? Aaargh! My head is aching! Can you lovely people help me!?! Which one. The pressure is on a bit as for the first time ever I am entering three paintings into the Dorset County Show and this might be one of them. 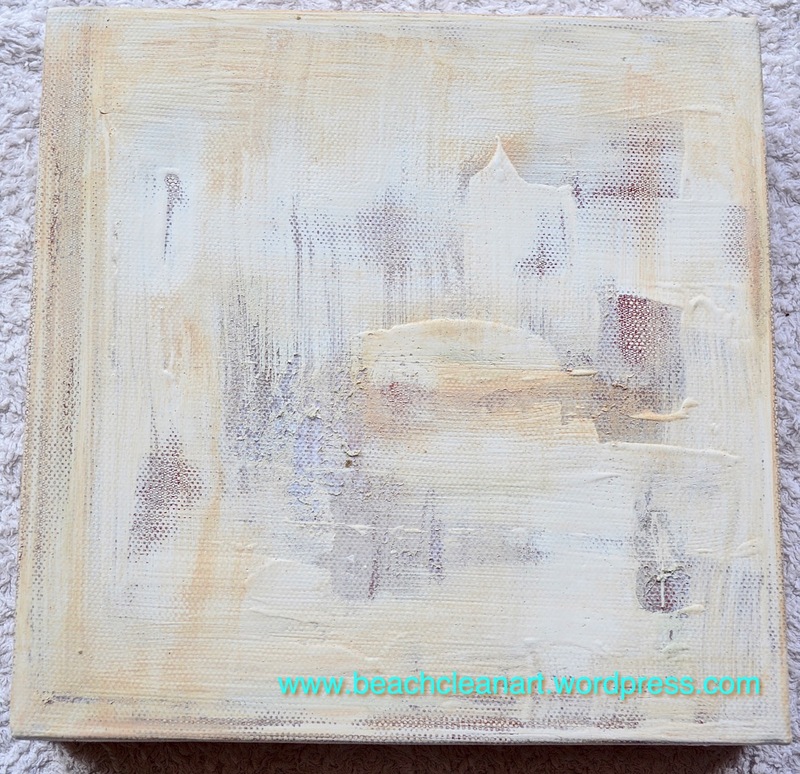 Joining in with Paint Party Friday where you can see masses of wonderful artworks.